Wars are often the result of a series of events. Sometimes, there is no intent to start a war, but one event leads to another and eventually, conflict results. That is true of wars that involve violence and trade wars. We may be seeing the early stages of a trade war after China announced steps to retaliate against steel and aluminum tariffs that the US imposed. China’s next steps will include 25% tariffs on pork, 75% tariffs on fruit and dozens of other targeted tariffs. “In order to protect its interests and compensate for the damage caused by the measures taken by the U.S., China has ceased its obligations to reduce customs duties on 128 categories of goods of on seven categories imported from the United States,” the Chinese Ministry of Finance said in a statement. 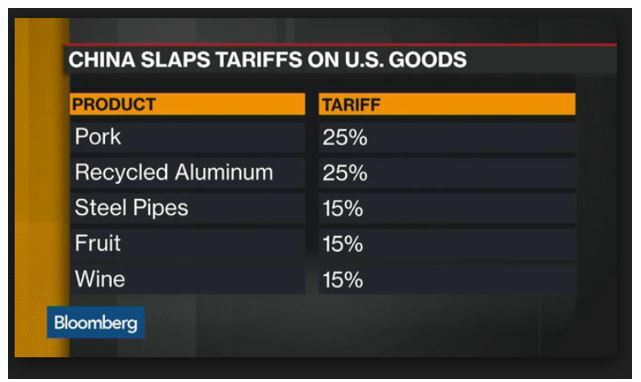 They said the need was to compensate for losses due to the metal tariffs. “The pork tariff means an increase of around five percentage points, depending on the type of pork meat exported. For example, according to the U.S. Meat Exporters Federation, China charges a 20% tariff on chilled pork and a 12% tariff on frozen pork. China also charges VAT taxes in the teens, so it may be that this increase is not all that much from what pork exporters are already living with. Despite the already existing tariffs, last year, the US pork industry exported $1.1 billion of pork products to China, making it the third biggest market in terms of dollar value. Japan is No. 1 in terms of value. In terms of weight, the U.S. exported 309,284 metric tons of pork meat to China out of 2.45 million tons total. The US is the world’s largest pork meat exporter. Tyson Foods (NYSE: TSN), a company associated with chicken, sold off on the news. Although Tyson is the largest chicken producer in the country, it is also among the largest beef and pork producers in the country. The news adds to the company’s woes and weighs on the stock. As the chart below shows, TSN was already in a down trend. The selling, however, could be overdone. TSN is now trading at less than ten times earnings and buyers are likely to offer support near the current price. As with the ownership of any stock, buying TSN could require a significant amount of capital and exposes the investor to standard risks of owning a stock. For TSN, the April 20 options allow a trader to gain exposure to the stock. An April 20 $70 call option can be bought for about $1.50 and the April 20 $72 call could be sold for about $0.75. This trade would cost $0.75 to open, or $75 since each contract covers 100 shares of stock. For this trade in TSN the maximum gain is $1.25 ($72 – $70 = $2.00; $2.00 – $0.75 = $1.25). This represents $125 per contract since each contract covers 100 shares. 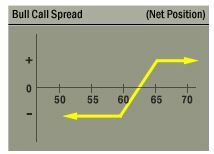 Most brokers will require minimum trading capital equal to the risk on the trade, or $75 to open this trade. That is a potential gain of more than 65 based on the amount risked in the trade. The trade could be closed early if the maximum gain is realized before the options expire.